The all-new BMW Z4 Roadster has arrived in India in two variants, starting at Rs 64.90 lakh (ex-showroom). Take a tour of all the incredible features here. All those who love luxury sports cars have another reason to celebrate as the German car maker introduces BMW M Performance model for the first time in India. 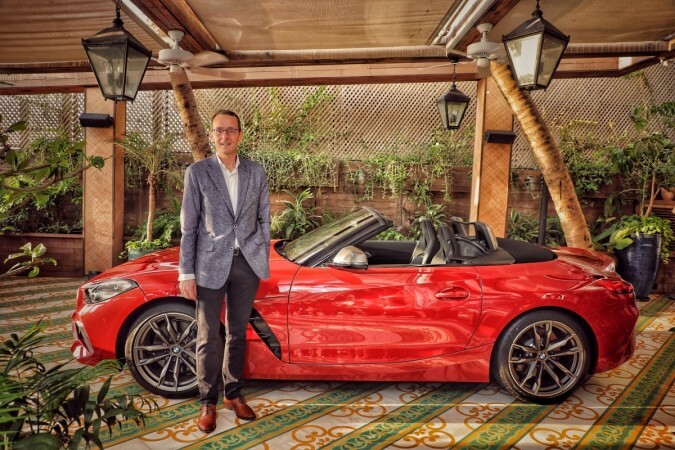 2019 BMW Z4 Roadster has officially arrived in India to raise the performance standards higher for Indian consumers. The all-new BMW Z4 Roadster comes in two variants, starting at Rs 64.90 lakh (ex-showroom) for sDrive20i variant and Rs 78.90 lakh (ex-showroom) for M40i model. Bookings for the latest convertible are open across all dealerships in India. BMW Z4 Roadster is a powerful machine packed with incredible features to justify that premium price tag. With a sporty design, powerful engine, innovative features, the classic two-door convertible roadster is sure to win hearts in India through sheer driving pleasure and overall experience. Let's dive into the specifics. The all-new BMW Z4 Roadster sets a slightly different course than the traditional BMW cars. The signature kidney grille with larger air intakes and fog lamps cannot miss an eye, but the refreshed angular design for the headlamps instead of the signature double-barrel look is grabbing all the attention. But that's not all. BMW Z4 Roadster is just as stylish from the back, with its wraparound LED taillamps, dual exhaust pipes sitting on a gloss black bumper and mildly swept-back spoiler to give the car a total sporty look. There are large vents on the sides, between the doors and the tires that fuse into the car's contoured structure. The 19-inch M light alloys painted glossy black add value to the overall form factor. The 2019 BMW Z4 Roadster is an eye-candy convertible. The flow of exquisite design extends to the interiors of the BMW Z4 2019, featuring a leather and Alcantara interior with blue contrast stitching and blue piping. The M Sport Package completes the posh feeling with M Aerodynamics Package, M exterior Badging, elements in BMW Individual Black High-Gloss Shadow Line finish, door sill finishers with M designation and M Leather Steering Wheel, the carmaker noted. The new Z4 Roadster has a 10.3-inch multimedia display and a 12.3-inch digital display to show drivers all the necessary information that enhances the overall driving experience. The two-zone climate control, electrically adjustable front seats, ambient lighting, 364 watt Harman Kardon system, a Head Up Display and more such features add to the premium cockpit experience. BMW Z4 Roadster has no room for compromise as drivers get nothing but the best interiors. Now for the things that matter the most, BMW Z4 Roadster packs exponential power under that sports-car style extended hood. There are two engine variants, both petrol and automatic. The Z4 sDrivveS20i comes with a 2.0-litre four-cylinder 8-speed engine that pushes 194 horses and 320Nm of peak torque. The base variant reaches 0 to 100 kmph in 6.6s with a top speed of 240kmph and has a 14.37kmpl range. As for the powerful Z4 Roadster M40i, there's a 3.0-litre six-cylinder 8-speed transmission engine delivering an impressive 340hp and a maximum of 500Nm peak torque. It reaches 0 to 100kmph in a matter of 4.5 seconds. Both models get Steptronic Sport Transmission for smoother gear shifts, and features like Auto Start-Stop, ECO PRO mode, Brake-Energy Regeneration and 50:50 Weight Distribution. Drivers can switch between ECOPRO, COMFORT, SPORT/ SPORT+ to enjoy different driving experiences. The Z4 M40i gets Adaptive M Sport suspension, M Sport brakes and M Sport differential to make the upgrade worthwhile. With great power comes great responsibility and BMW has no intention to compromise there. With front and side positioned airbags, Anti-lock Braking System (ABS) with Brake Assist, Dynamic Stability Control (DSC) including Cornering Brake Control (CBC), side-impact protection, electronic vehicle immobilizer and crash sensor and an emergency spare wheel, the all-new Z4 Roadster will give you little to no reason to crib. Additionally, 2019 BMW Z4 Roadster gets features like pedestrian detection, emergency braking, rear collision warning, lane departure warning, cross traffic alert, auto parking feature and adaptive cruise control.